Since starting his career as a racehorse trainer, James has been very successful, training multiple group winners and taking of some of the most competitive and toughest handicaps in the United Kingdom. In the UK alone James has amassed over £3 million in prize money since the late 1990’s. This is a huge testament to James and the team he has. He has never had a huge number of horses, but with the attention to detail afforded the horses, what he has had he has always won with. 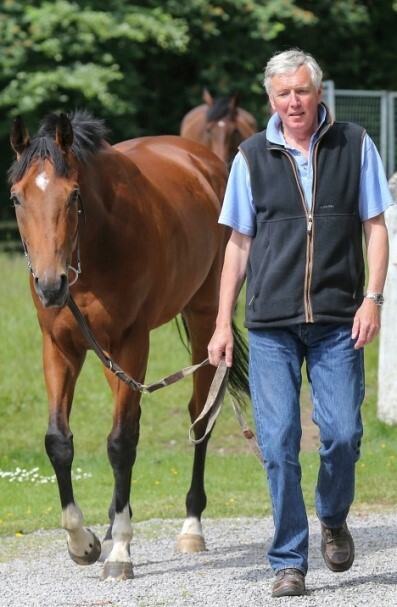 Not only has James had winners in the UK, but he has also had runners and winners in France, America and Dubai; he has never been a trainer to shy away from travelling his horses around the globe when he thinks it may be fruitful. Furthermore, to the international status, he not only travels his horses to race abroad but has been hugely successful at buying yearlings and selling them on as racehorses to countries such as Hong Kong, Australia and America. There are many great examples, one being Hartley, bought for 18,000 guineas and sold on to Hong Kong for in excess of £250,000, he not only amassed this great sum, but also gave his owners great pleasure when just touched off by a subsequent Group 1 winner at Glorious Goodwood. In 2014 we sold three horses at the Newmarket Horses in Training Sale; Penhill, Braidley and Scrafton. All three horses were bought as yearlings for a total of 43,000 guineas and sold for a total of 375,000 guineas, a fantastic return on investment considering each horse had already won more prize money than they actually cost. The following years have also proved fruitful with many winners and 2017 was a great year for us, winning the Zetland Gold Cup to having a Glorious Goodwood winner. Our two year olds also flew the flag for us with Ulshaw Bridge winning at York. Once again in 2018 our 2 year olds stood out for us, this time with Hesslewood winning the £25,000 Book 1 Bonus at York. Other consistent runners have been Ulshaw Bridge, and multiple wins from Portledge and Cale Lane helped salvage a not so smooth year at Thorngill. In addition to our runners, the sales have proved successful with Adjourned making 110,000 guineas and the purchase of some very exciting prospects for 2019. Briardale, Mine, Strawberry Dale, Hunters of Brora, Rich Ground, Penhill, Ulshaw Bridge, Chrinquita and New Society.